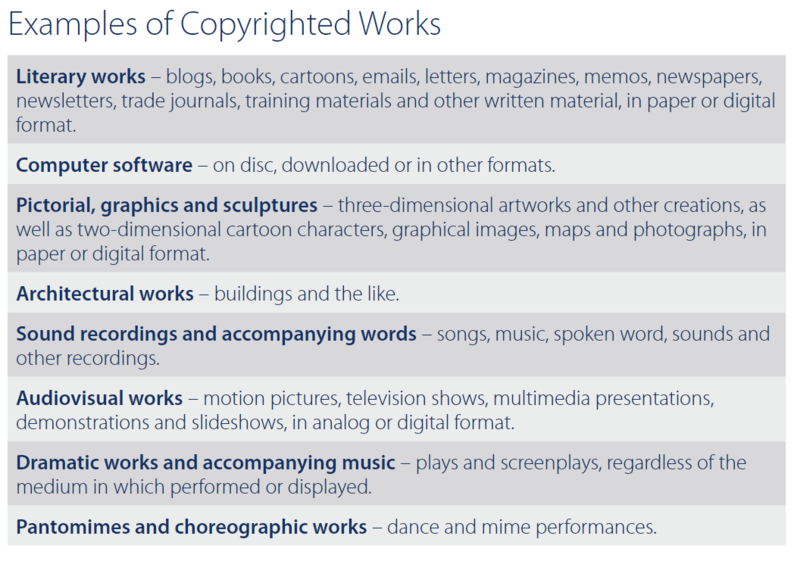 Practical steps for businesses to comply with copyright law. Your decision to invest in an Annual Copyright License from Copyright Clearance Center is proof of your organization’s desire to comply with copyright law. To further assist you in achieving that goal, we have developed the following guidelines for drafting and implementing a copyright compliance policy for your organization. We’ve also provided a sample policy that you can tailor for your own use. Please feel free to use these sample guidelines in creating a copyright compliance policy for your organization. Solicit specific advice for your business from copyright experts, including corporate librarians and legal counsel, with special expertise in both interpreting policy and understanding your company’s use of copyrighted works. Solicit input from representatives from other company departments: human resources, sales, marketing, research and general management to understand the ways copyrighted materials are used within each department, internally and externally. Ask for guidance from your CCC account representative by phone at 978-750-8400 or email licensing@copyright.com. Convey the policy to company employees through email, the company intranet,company-wide meetings, etc. Incorporate the policy into new employee welcome kits, existing employee manuals or other guidebooks. Post the policy near photocopy machines, on your company bulletin boards and intranet site and in other prominent places. No employee of [Company Name] may reproduce any copyrighted work in print, video or digital form in violation of the law. Works are considered protected even if they are not registered with the U.S. Copyright Office or any registering agency outside the U.S. and even if they do not carry the copyright symbol (©). 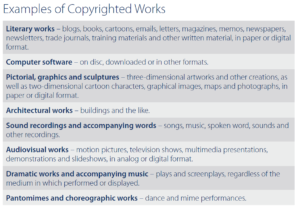 Copyrighted works include, but are not limited to: printed articles from publications, electronic articles in online publications, online videos, movies, TV and radio programs, recorded music performances, images, training materials, manuals, documentation, software programs, databases, websites and blogs. In general, the laws that apply to printed materials also apply to visual and digital formats such as websites, streaming media, music downloads, mobile apps, CDs and DVDs. [Company Name] holds an Annual Copyright License [and Multinational Copyright License] from Copyright Clearance Center (CCC), which enables employees of [Company Name] [inside and outside] the United States to lawfully reproduce and distribute content, in print or electronic format, as needed within the company. Under the license [Company Name] employees can copy and internally distribute excerpts from newspapers, magazines, journals and other copyright-protected works licensed by Copyright Clearance Center, as often as needed, provided that the license may not be used as a replacement for subscriptions or primary purchases of thepublished materials. Employees can also e-mail articles of interest to other employees, share articles by posting them on our company intranet sites, store articles in shared folders, and scan content when a digital original is not available. The license also authorizes employees to provide a single print or electronic copy to a client or prospect upon his or her direct request for further information relating to [Company Name’s] products or services, and to submit copies to government agencies as required to support regulatory submissions. Please note that the license applies only to the works in CCC’s online catalog and that, except for the limited external uses described above, the rights provided are for internal use at [Company Name] only. [Additional language if organization holds a Motion Picture License separately or in combination with the Annual Copyright License][Company Name] holds a Motion Picture License (“MPL”) from Copyright Clearance Center, which enables employees of [Company Name] in the United States to show copyright-protected videos, movies and TV shows (“Videos”) for the purpose of employee training, internal sales presentations and company meetings, as needed within the company. Under the license, employees may show Videos by the listed theatrical distributors and producers from ANY legally obtained source, including DVDs purchased at retail, videos downloaded from iTunes or videos streamed from websites like hulu.com™ and Netflix™ that are authorized outlets of motion picture content and TV shows. 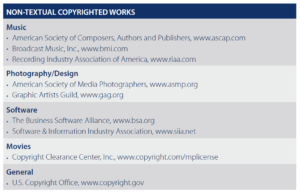 To verify if a Video is covered under the MPL, simply determine who the distributor of the Video is and look it up in the distributors and producers list available at copyright.com/mplicense. To obtain permission to reproduce copyrighted works outside of [Company Name] and/or to use such works in ways that are not covered by our license or other prior agreements, employees should request permissions online at www.copyright.com or contact the Rights and Licensing Department of the copyright holder. Questions on specific procedures should be directed to the [Title], who serves as our copyright officer. [Company Name] designates [Title] as the copyright officer to administer our company’s copyright policy. [Title] at [Company Name] can help you determine whether a work is covered by our Copyright Clearance Center license and how to handle any special copyright issues. 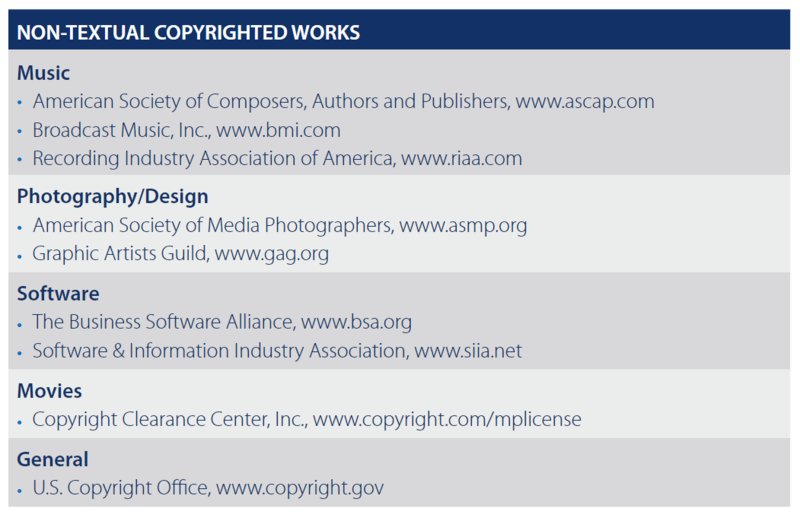 Questions concerning copyright procedures, including fair use, should be addressed to [Title]. [Company Name] expects its employees to be responsible consumers of copyrighted materials. We also encourage employees to educate their peers on copyright compliance.If any employee witnesses a potential copyright infringement, please bring the matter to the attention of the individual as well as to our [Title], who serves as our copyright compliance officer. Employees who illegally duplicate copyrighted works may be subject to disciplinary action up to and including termination. Copyright Clearance Center’s (CCC) solutions for businesses are designed to help you discover, access, share and manage content anytime, anywhere, while respecting the copyrights of others.